On the home page of Boston.com, it looks like the publication is advertising a parked domain name. Under the “Most Popular” heading on the right side of the home page, there is a headline that says “Love Letters.com.” Not only is LoveLetters.com a domain name parked with Uniregistry, but the publication doesn’t even own this domain name either. This makes no sense to me. When visitors click on the sidebar link, they are taken to a feature section called Love Letters. Interestingly, when hovering over the LoveLetters logo at the top of the page below the masthead, the alt text is “Love Letters .com.” According to the About page, “Love Letters is a daily dispatch of advice for the lovelorn that launched on Boston.com in 2009.” It doesn’t seem to make sense to promote this as LoveLetters.com. This does not appear to be a one-time issue from Boston.com. 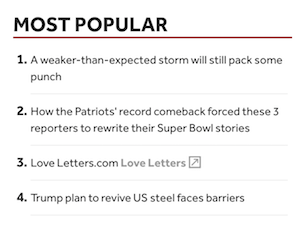 In looking at an Archive.org entry from October of 2016, LoveLetters.com was also referenced in the same “Most Popular” heading on the Boston.com homepage. LoveLetters.com is a domain name owned by a domain registrant in Maryland. LoveLetters.com was registered back in 2000. According to Estibot, LoveLetters.com is worth $274,000, so even if Boston.com wanted to use this domain name, an acquisition would be very expensive. Smartly, on the Love Letters Twitter page, there is no mention of LoveLetters.com. When companies try to get cute, they risk losing traffic. It doesn’t make much sense for Boston.com to promote “LoveLetters.com” when it doesn’t even own the domain name. Wow – can’t believe you would lend any credence to “Estibot.” Are they one of your advertisers? Elliot, on the one hand you do seem to realize how horrifically this can go badly, and yet at the same time you don’t seem to realize how horrifically this can go badly. Notwithstanding your former words, you are clearly lending an endorsement to harmful things like Estibot. Oh yes – it very probably would hurt a sale. I don’t know how you can conclude something like that. I would surmise you simply have a “spoiled perspective” because you tend to focus on safe “blue chip” no-brainer domains about which there would tend to be little or no ignorance among people about the value. I won’t even use the word “debate” because “ignorance” is really the most appropriate term here. So it doesn’t hurt you to lend the best light to something like Estibot when it is to your own advantage because it would probably almost never affect you in any significantly bad way. But lending any credence whatsoever to abominations like “Estibot” and the like leaves people with atypically yet super valuable domains in for a needless problem based on total “algorithmic” nonsense that has no basis in or connection to reality whatsoever. Do you see any type of advertisement? For the record, they don’t advertise, they have never advertised, and I don’t receive any sort of discount for my account with them. Right, I think I wasn’t exactly harping on the formal advertiser angle, but the bottom line is that what you write about them including in the past amounts to a de facto and implicit degree of endorsement in part which has the implications and likely consequences I described above. Moreover it’s not merely that as I put it things like Estibot “very probably would hurt a sale,” but rather I’m completely confident and all but certain enough it has already hurt many sales for people. I’m personally even not exactly without experience receiving some kind of reply from a potential buyer about the supposed “valuations” of those troublemakers myself in the midst of a negotiation on at least one occasion recently. So, while I clearly was not harping on the advertiser angle, it is also nonetheless reasonable for me to wonder whether there is the social angle as well. For instance, even if they don’t advertise here, do you not know the people behind such services socially perhaps? Friends or friendly acquaintances, and therefore reluctant to speak of such services the way so many others in the industry wouldn’t hesitate to do? Escrow.com has taken quite a beating lately, but how many people mentioned that much to anyone of them at NamesCon recently when some of their people where there rather than having fun mingling? But really my other point above I believe is most likely in your case. You are simply likely to more or less always be immune to the kinds of problems these “services” can cause people because of the type of domain names you focus on, so it’s no skin off your nose to occasionally lend them some credence or suggest they have any merit because it simply might be to your financial advantage to do so. You are more or less likely to always be on the receiving end of the degree to which their “determinations” can be of some benefit to some. So whether it’s some of the above or all of the above, these “services” are well described as “abominations” that are bad for the industry, and bad for a lot of people that have to deal with the harm they cause. I think Estibot is good for illustrative purposes, hence the mention. I also use it when discussing UDRP cases on 3/4 letter .com domain names or one word .com domain names. The domain business is a bit opaque. Explaining that a domain name is very valuable can be a bit difficult. Showing an Estibot value is illustrative and easy. (1) I use Estibot/Valuate as a “sanity check” or order of magnitude indicator. (2) I am aware of their limitations and compensate accordingly. (3) A recent story: In the course of checking the estimated values of some of my domains, I came across one that was estimated significantly higher than I would have expected. I then did a little more research (eg namebio) and decided to do some outbound promotion for it. I already have two interested parties. I never would have started that campaign if I hadn’t been alerted to the domain’s value by valuate. How inaccurate on both ends. Happy Valentine’s Day to all readers.